Enveloped, spherical. Diameter from about 150nm. Negative-stranded RNA linear genome, about 18 kb in size. Encodes for nine proteins. The viral RNA dependent RNA polymerase binds the encapsidated genome at the leader region, then sequentially transcribes each genes by recognizing start and stop signals flanking viral genes. mRNAs are capped and polyadenylated by the L protein during synthesis. The V protein is produced through RNA editing and the C protein is produced by Leaky scanning of The P mRNA. 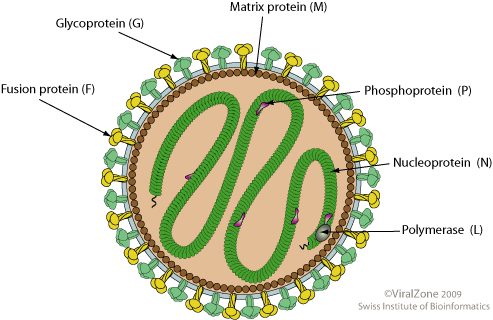 Virus attaches to host cell surface receptors through G glycoprotein. Replication presumably starts when enough nucleoprotein is present to encapsidate neo-synthetized antigenomes and genomes. ETYMOLOGY Henipavirus: from Hendra virus (Hendra after the Brisbane suburb from which it was first isolated in 1994) and Nipah virus.